Julianne Smith-Devereaux, Author of I GOT OUT ALIVE! 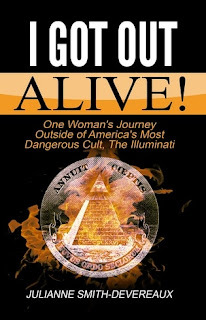 Today we are interviewing Julianne Smith-Devereaux about her non-fiction book, "I Got Out Alive! One Woman's Journey Outside of America's Most Dangerous Cult, The Illuminati." Well, I was born in Hollywood, California and I am 48, soon to be 49 years old this year. I am married and have a 15 year old son and live outside of California at this time. I obviously cannot tell you where, because of 'Them'. It is Non-Fiction, everything that is written in this book happened. Period. Nothing is made up for the reader to be more 'interested', 'scared' or just for 'shock value'. I think anyone would enjoy this book. Especially anyone who has children, Pastors, Church goers and young adults. To be informed that these 'People' DO exist, The Illuminati are NOT a 'myth' and that they LOVE to recruit young adult's to do their 'less-important deed's'. Such as young people on College campus', Summer Camp's for specific undertakings like Football camp, Cheerleading Camp, any sport's camp's, really. Even Church camps. Mainly Christian Church camps because they are the 'opposite' side of the coin, so to speak. It gives them great joy to recruit Christians into the Fold, or Organization. What inspired you to write down the story of your escape from the cult? I really wanted to tell my story for a very long time. I kept getting thwarted because of my father being around me almost 24/7. So, obviously, I couldn't write it then. Plus I was also worried that the people who did indeed read it, wouldn't take me seriously, think that I was just some 'whack-job' or made this up just to get attention. Stupid, stupid reason's. I finally HAD to warn parent's, and to tell people in general, that these Sick, Sick, People, like I have said before, do exist. They are everywhere. Not just in one area of the United States. But, literally, everywhere. Mainly the recruiter's. The Member's of this group, we used to call them 'They', (probably still do), basically live all over the world. 'They' would have meetings, twice a year, usually in Europe. At a different location everytime as well. To keep their meeting location's secret of course. Sometimes at The Bohemian Grove. Also a place that I have been too. Your father was an important member of the cult you were raised in. Describe your father for us. Would outsider suspect he was in a cult? Well, he still is the 'Head' of this Organization. He was recruited by his father as well. My father is a cold man, never shows his emotions, very domineering, no one in his employ would question a thing that he told them to do. Because they knew what the consequences would be. Right now he is in his early 60's. He looks like he is in his 40's. Long black hair. Almost down past his hips. He 'fell' for me, I am going by what he actually told me here, because of my brain, my 'looks', and I guess he felt that he could trust me. When I was little, like every young girl, I worshiped him. I worshipped the ground he walked on. And whatever he told me to do, I did. Just to make him happy. As far as people suspecting that he was 'in' a Cult? No way. They would think he was a European or someone not born in this Country. Probably because of his long hair. He looks almost Greek or Middle Eastern. And he is Middle Eastern. Syrian. So, I am half Syrian. And I sure as hell don't look Syrian. What do you think are some of the biggest misconceptions people have about cults in America? The only thing that I've heard from other people regarding or about Cult's is negative things. And they are true. So, in answer to your question, I don't think they have any misconceptions at all. To me, now that I know a lot about Cult's, they are all pretty bad, evil or 'negative' in their beliefs. You were indoctrinated from an early age. At what point did you start to question what your father and his bodyguard was telling you? At around 11 years old. At that time I started to wonder why I was told to assasinate people that I didn't even know. I didn't, or, rather, wasn't told what they had done to deserve it. At 11, that was as far as my thought's went. It wasn't until I was in my early twenties that I realized that not every girl or woman slept with their father and wasn't treated as a 'wife' figure to their father, either. He kept me pretty segregated from other girls my age, so I wasn't having sleep-overs, watching how their families interacted either. So I never had anyone to compare it to. Part of your indoctrination was to be trained as an assassin. Can you tell us a bit about your training? Yes, that was part of it. Probably the last part of my training. I remember I was always practicing shooting. I started my training before I was even a year old. My father would take me from the maid, right after a bath, and he would be completely naked, except for a towel wrapped around his waist. He hadn't taken a shower or anything, so he still had 'the day's' smell on him, his cologne smell, his own body smell on him. Things or smell's like that. Anyhow, he would take me and lay on his bed, on his back and lay me on his chest. While I was laying on his chest, he would talk to me in a soothing voice. Saying the same things over and over. Never changing the tone of his voice. He did this every day, after work, until I was 3 years old. I am assuming, so I would get used to his 'smell' and his 'calming' voice. He wanted me all to himself. I figured that out when I was around 4 years old. I am pretty sure that he wanted me to, no matter what, think that he was the one I could trust. The only one I could run too when 'in trouble' or scared. Things like that. And I did. For many years. That was the very first part of my training. I don't know the order of it all. But I do know sensory deprivation was part of it. I was placed inside of an all white room with nothing inside of it. Nothing. Just me. At first They would play extremely loud music. Like hard, hard rock. Loud crap. Not even what I would call music. They would play that for two day's straight. Then, at some point, they would shut it off. I would have, I thought, silence for at least a day or so. Or be able to leave the room. After about 20 minutes? And that is just a guess because my ear's were just all screwed up. Trying to get used to the silence again. Then, they would blow (I do not know HOW they did this) through the vent in the room, the smell of a delicious meal. At dinner time it would be a freshly cooked steak, or some kind of meat; maybe potroast or something. Then the smell of fresh mashed potatoes, things like that. This same thing would go on during breakfast, lunch, and, of course, dinner time. Between those times, I would call them the 'Food Times, I would hear that blaring hard rock, horrid, music again. This went on for 3 days. And I was never fed during those 3 day's either. So, you could imagine how horrible it was on the last day. I was finally fed on the last day, too. When I had digested the food, there was no restroom, so I had to 'go' in the room. I picked a corner of the room. I remember the far corner behind me to the left. Since I had zero clothes on, I was constantly freezing. Come to find out, they had the air conditioning on at 60 degrees. It blew ALL DAY. After the air conditioning and the smell of food, after I hadn't eaten in 3 day's, it stopped. No more super freezing air and no more food smell. By that time, I was so desperate, I was either crying or laughing hysterically. This was after 1 month of this. Going on 24/7. No breaks, no shower, nothing. Finally, after 3 months of this, the lights dimmed to a 'normal' lighting arrangement, the music, to me at least, was quieter, and I was being fed, gradually, but every day. After a full week of this (seven day's) my father walked in. I looked up expectantly and stood up and ran into his arm's. He made it that way so that it looked like He was my 'rescuer' or 'savior'. It was all mind games, mind games, mind games. All to the end of that. My father being my rescuer. One of the other major training sessions I had was 'How To Fight... Like A Man'. This included me learning how to fight. With your fist's. They wanted me to be able to basically fight men, other member's of The Org., etc. And They gave their all as did I. After my trining session's. It finally got to the point where I could 'beat up' a man, a woman, anybody, really. In case I did actually get caught on one of my 'missions' overseas. I remember one day, my father's main bodyguard, who is tall as Hell and worked out everyday, would come into the 'work-out' room. Or, during one of these excersises, the actual Fighting Excersises, it was usually held in my father's Gym. Of course, like always, They would all be there. Just to watch. He was told to fight me, physically, like he was fighting a grown man. At this point, I had only two day's of training. So, basically, none at all. I was beat to a literal pulp. Bloody, broken, nose, jaw, ribs, and my left arm. My arm was a compound fracture. But since my father had his own personal surgeon/doctor, my arm was operated on at my father's home. So as not to, obviously, cause any unwanted attention. Basically all of my training were things of that sort. I learned how to Fence. My father taught me that all himself. He was a great Fencer and he wanted me to be one too. Swords are still my passion. I love swords. I used to collect them, actually. When you revisited your memories to write this book, what was the experience like? I knew that it would be a very tough, emotional, roller-coaster ride. I had a lot of years of therapy before I wrote this book. And since having my son and being married, yes, in that order, :) it made me grow up in such a way to where I just could NOT believe that a child should, let alone could, be brought up this way. Not to mention being put through ALL of this by one of your parent's. At that time, looking at my son and just thinking about his gifted life, and then comparing his to my life at his age, I knew it was time to write it. I HAD to let other parent's know who was out there and what they did and do and will continue to do. I wanted them to not be ignorant on this subject at all. So, I had to figure out a way to write this book and keep me and my son safe. But, my son first and foremost. I knew my husband would try his damndest to keep both of us safe. So, I just thought, 'Screw it. I am doing this now. And I did. And, like I thought, it WAS an emotional roller-coaster. But I got through it alright. I feel that I can get through anything pretty much. Now anyway. I would hope that, mostly, it will open their eye's. I hope that they will, at first, not believe what 'this girl' endured. But at the same time, be thankful that they did read it and know that they have a new 'box' of knowledge in their mind. They will know what to look for if their child/young adult gets involved in something like this. The sign's are almost exactly the same as if they started using drugs. They get distant, not talk or share as much as they used too about their day at school/college. The hard part, though, about this sort of thing, is that once kids are IN college, they are by law, adults. The LAST thing that they want to do is share with their family. Hell, they had to do that when they were in Elementary up to Senior year in High School. If they say that they are 'too busy to come home for a certain holiday'... one where they ALWAYS came home. That could be a sign. I say 'could' because they could actually have something going on with friends that is totally normal. I don't want every parent who reads this book to become paranoid. And then possibly get all in their young adult's lives 'all of a sudden'. Then their kid's will back off on purpose. Just to be rebellious. Well, since this book was my first. IS my first, and it ends when I am still trying to keep my father and especially THEY at bay, I would like to write a follow up to it. It just depends on how it goes. IF I had to write something totally different? Probably FICTION! Something not so close to home. That would be nice. I would first like to thank them immensely for buying AND reading it. If some of them are a tad bit 'squeamish' at heart? Please read a little at a time. But, mostly, I would like them to take away the knowledge of what I have said before. This IS going on. Every day, every hour, every week and every minute. I have an idea of where ALL of these 'missing' kid's' are. After you read my book, you will too. Just try convincing the police. Let alone FINDING Them. Or where THEY are. They are everywhere. But the one's that would most likely get caught are the recruits. Who know absolutely nothing about the inner workings of this Group, Cult, Order, whatever you want to call 'They'. Catching Them, and I can tell you this from actual experience, will be basically, IMPOSSIBLE. One hundred percent. I just hope that they are aware of their child's involvement before they are so wrapped up in it that they will never see them or hear from them again. EVER. That's about it. Thank you.